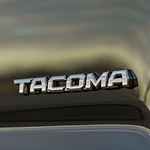 The Tacoma comes with the Pre-Collision System with Pedestrian Detection. This system uses an in-vehicle camera and radar to detect for vehicles and pedestrians in your path. When an object is detected, the system will provide you with an audible and visual alert. When you don't brake in time, this system can also apply the automatic brakes. Another safety feature that comes equipped with the Tacoma is the Lane Departure Alert with Sway Warning System. When you are traveling over 32 mph, this system can detect for lane markings and will provide you with a visual and audible alert when it senses unintentional lane drift.